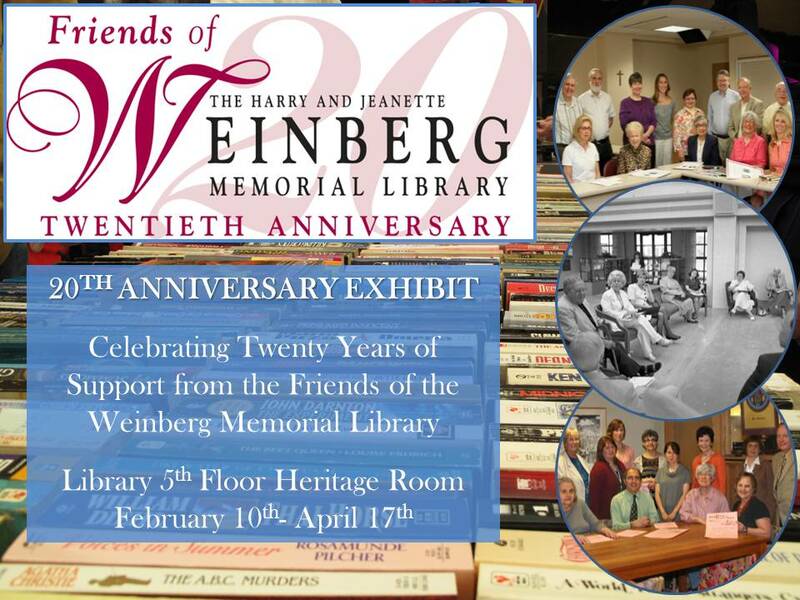 Congratulations to the Friends of the Weinberg Memorial Library, who mark their twentieth anniversary in 2014! For two decades the Friends group has been committed to helping the Library excel in meeting the dynamic scholarly, cultural, and social endeavors of the University and the community at large. In celebration of the anniversary, a small exhibit is on display in the 5th floor Heritage Room showcasing the years of support from the Friends group, including their various activities, events, and Endowment. The exhibit will be on display until Thursday, April 17th. Visit our Friends of the Weinberg Memorial Library webpage to learn more about the Friends group and how you can become a member. For more information about the exhibit, please contact Special Collections Librarian Michael Knies Michael.Knies@Scranton.edu 570-941-6341.